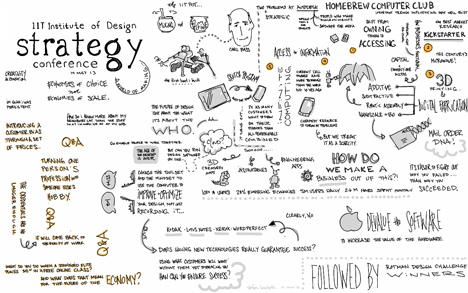 The IIT Institute of Design held its annual Strategy Conference last week in downtown Chicago, a two-day event full of inspiring and interesting talks about using design thinking and innovation to solve complex issues. Socially conscious innovation was a common topic this year, from improving agricultural techniques in Africa to enabling University of Chicago students and professionals to collaboratively tackle major problems in healthcare, as well as revitalizing abandoned lands in Detroit with a community development and agriculture program. Check out the sketchnotes below summarizing the ideas behind this years event. Youll find synopses on speakers like Carl Bass with Autodesk, Catherine Casserly of Creative Commons, Stepan Pachikov, founder of Evernote, Bruce Nussbaum and Barry Schwartz from Swarthmore College, among others. This entry was posted on May 22, 2013 by Carmen Alia in News and tagged 2013, Design, Innovation, leaders, strategy.